Hard to choose just one right? I chose the one in the middle. Cecilia is her name and she hails from Horchow. This chair told me that she is classy but don't take her too seriously, she likes to have fun. So I put her in a fun family room. *The paint color is Tundra by Benjamin Moore 2133-70 A light gray that reads as a neutral putty color. *I have always loved this bold Chiang Mai print from Schumacher. I used it loosely for color inspiration and picked up on the blues, greens and a bit of coral in the space. *A Charles of London style sofa from Lee Industries in a lime green fabric. *I love this set of nesting tables in an antique brass finish, topped with a fun owl lamp from West Elm. *If I was a piece of furniture I might be this beautiful bombe chest from Crate and Barrel. Love those curves! I am using it as a side table. Perfect for stashing away odds and ends. *I topped it off with this simple industrial looking lamp from Ikea. *The floor lamp picks up on the other curves we have going on in this space. It's from World Market. *The other pillows I picked for the space are the gray and ivory geometric (pricey but easy to DIY), A large scale coral ikat from Z Gallerie, and a velvet blue pillow from Crate and Barrel. *Finally I would either find a vintage Federal Eagle Bullseye Convex mirror in wood or Syroco (check Ebay) mounted over the sofa with a gallery wall of black and white family photos (and a few graphic prints) in gold, silver and black and white wood frames. Please go check out the other entries and have a fabulous Monday! Thanks Anna. Loved your room too! Great design Annie! I like how you pulled together a group of beautiful elements to create such a fun room. And of course I LOVE the chair! It was really fun. I hope Sarah has more of these! What a gorgeous design, Annie! I love that everything in your room is pretty and elegant, but pulled together in a way that seems truly fun and livable. Thanks for dropping by and commenting! Thanks for stopping by Erin! Your room was really fun as well! Love this room Annie! It is so fun to see the same chair in a totally different space! I love the spindle chair and green sofa! Thanks Laura, I loved seeing everyone's take on the chairs too! Hi, Annie!!! I'm so excited you came to the party...and with such a beautiful room!!! I'm happy that you picked the blue and white chair, and I love how much depth you were able to achieve here (with so many other colors and patterns and texture)...something I was having trouble doing with this chair and so switched to the green one! I really like how you layered the rugs. And a lime green sofa?! I never would have thought of that, its awesome, especially with those pillows. The gallery wall with mirror is stunning. I really love how you have such a wide variety of sources here, they are so beautifully put together to create a collected room. So glad you played along, thank you!!! 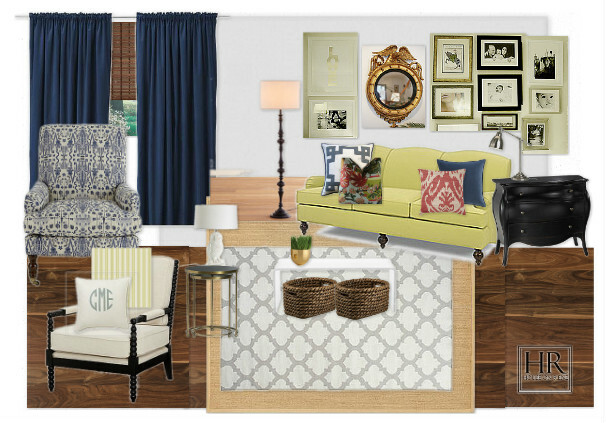 Thank you Sarah for putting together another Mood Board Monday! It was my first time participating and I loved it! You are too sweet in your compliments, thank you. Hope you are recovering well, hope to see you in the blog world again soon!